The Black Forest area in El Paso County, Colorado is a large forested area northeast of Colorado Springs. With everything from small cabins to vast acreages and multi-million dollar homes, The Black Forest area appeals to many people. 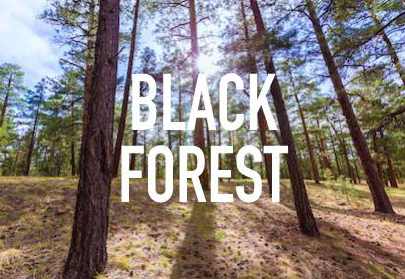 Most lots in Black Forest are 5 acres and have private wells and a septic system. Some parts of Black Forest are in Academy School District 20 and the area further east is in Falcon 49 School District. There are many different types of neighborhoods to suit different needs and tastes, some with strict covenants and others with none at all. There is an independent spirit in the Black Forest area and a pride that shows in the beautiful and unique homes people build. In the quiet sea of trees you'll find basic services as well as wonderful and unique offerings; bed and breakfasts, spas, churches, La Foret Conference Center, The Black Rose Acoustic Society, Black Forest Regional Park and Fox Run Regional Park among many others. Black Forest is part of Academy School District 20 and Falcon School District 49. It is home to Meridian Ranch Elementary School, Edith Wolford Elementary School, Pine Creek High School, Falcon Middle School, and Falcon High School. The Black Forest area encompasses 200,000 acres. The area is heavily wooded with some open grassland areas. This beautiful rural setting was named by a German immigrant who thought that the dark hue of the Ponderosa Pines very closely resembled The Black Forest in Germany. The area abounds with wildlife, and horses are a common sight. The commercial center of Black Forest is located on the corner of Shoup and Black Forest Roads. Here you will find the Community Center, Volunteer Fire Station, churches, a gas station and a country store.